Tucson celebrates International Women’s Day | Fight Back! Tucson, AZ - A dozen activists, students and community members celebrated International Women’s Day, March 8, at Revolutionary Grounds bookstore. After a brief presentation on the history of the socialist-inspired day, the group discussed the contributions of revolutionary women past and present. The event, hosted by the Freedom Road Socialist Organization, stressed the need for women’s role in organizing against the specific forms of oppression faced by working women under capitalism. Much of the discussion centered on the experience of women from oppressed nationalities and the necessity for creating leadership roles. 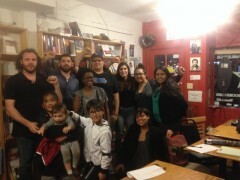 The attendees also agreed on the importance of building a strong working-class movement that can eliminate all forms of exploitation and oppression faced by the multinational working class. Commemoration was also paid to the late Berta Cáceres, a peasant and indigenous activist in Honduras who was murdered last week. Cáceres played a leading role in the struggle against multinational corporations that seek profit by devastating the environment inhabited by indigenous communities. The connection was made between the 2009 coup in Honduras that was approved by then-secretary of state and current presidential hopeful Hillary Clinton.